Today is the first day of fall, and this time of year brings fewer and fewer hours of sunlight. This means your home is less expensive to cool. But it also means people will be flipping on the light switch more often. Lighting accounts for as much as 12 percent of your electric bill. That’s more energy than your refrigerator, dishwasher, washer, and dryer all use combined! Always turn off lights when you leave a room. Switching off just one lightbulb that would otherwise burn eight hours a day saves you almost $20 per year. Also try timers and photocells that turn lights off automatically. One reason lighting uses so much electricity is because 70 percent of all light sockets still have inefficient incandescent bulbs instead of ENERGY STAR® certified bulbs like CFLs and LEDs. If every household in Texas swapped out just one incandescent bulb for one of these, we could save enough energy to light a home for a year. The energy cost to operate a traditional incandescent bulb for a year is $4.80. By comparison, a CFL costs about $1.20 to operate, and an LED bulb only costs about $1.00. When shopping for efficient bulbs, look for lumens to measure the brightness of the bulb instead of watts. Watts indicate energy consumed and lumens indicate light output. A 1,600-lumen ENERGY STAR® bulb has the same brightness as a 100-watt incandescent bulb but uses less energy. It’s not too early to start thinking about holiday decor. Consider upgrading to strings of ENERGY STAR® certified lights. They can last up to 10 times longer, and they’re also cool to the touch, minimizing the risk of fire. Many LED strings produce the same amount of light as those with incandescent bulbs, but use up to 90 percent less energy. Light fixtures themselves can also be energy hogs. Replacing five fixtures in your home with ENERGY STAR® certified models could save you $75 a year in utility bills. These fixtures, along with ENERGY STAR® bulbs produce less heat than incandescent, which means your air conditioner won’t have to work as hard. Visit TakeCareofTexas.org for more ways to conserve energy and water, reduce waste, keep the air and water clean, and save money. 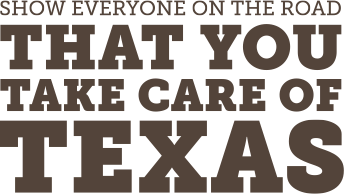 Then, pledge to Take Care of Texas, and we’ll mail you a free Texas State Parks Guide. For your convenience, we've created an infographic with the tips listed above. Download the infographic as a JPG or PDF to share by e-mail or on social media. Ask your friends and followers to do their part this fall to Take Care of Texas.